While school is back in session, summer isn’t over yet! There’s plenty of great outdoor live jazz to be had in central Ohio this weekend, courtesy of neighborhood festivals and concert series. Dwight Lenox & the Lenox Avenue Express kick off the 10th annual Lithopolis Honey Fest in downtown Lithopolis with a set of vibrant standards on Friday at 3pm. The Hot Times Festival celebrates 40 years with an eclectic three-day lineup in Olde Towne East, including performances by Arnett Howard & Friends, Foley, and the final performance of The Jazz Poetry Ensemble’s star-studded Hot Times Tribute on Sunday at 3:45pm – click here for the full music schedule. The Old Hilliardfest in downtown Hilliard features great jazz early on Saturday, with FLIPPO performing at 11am followed by the Colin Lazarski Quartet featuring Bryan Olsheski at 12:30pm. If you’re looking for fun with the kids, the summer season of PBJ & Jazz ends with a performance by the Kelly McLennan +5 at the Topiary Park downtown Saturday at noon. The 2016 Jazz At The Amp series at the Westerville Amphitheater wraps up with an electric fusion set from the Tim Dvorkin Trio Saturday at 6:30pm Jazz at the Amp has been postponed until September 24th. And on Sunday at 1pm, the 2016 Harrison West Jazz Stage schedule gets underway with the swinging sounds of the Vaughn Wiester Big Band Ensemble. Get out there and enjoy some warm live jazz! I am very excited to bring the band in – me, Zach Compston [drums], Greg Wolfram [bass] and Tom Davis on guitar. We will be playing music on the ‘groove’ side of things – lots of original stuff of mine and some selections that will be familiar to the audience. The band is firing on all cylinders right now (we played last night and had a great response) and we are looking forward to this opportunity! 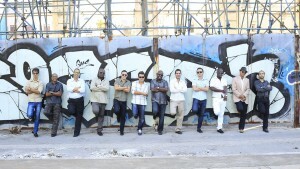 Wednesday, September 14th (8 – 10pm): The Havana Cuba All-Stars (picture by Jorge Nonell) at the Lincoln Theatre. In this new era of improved relations between Cuba and the the United States, this outfit of celebrated Cuban musicians is making its first tour of the US and Canada. Led by trumpeter Michel Padron, the All-Stars have a 12-piece lineup including vocalists, horns, strings, and percussion. Inspired by the traditional Cuban musical style Son, the band’s program “Cuban Nights” meshes inventive songwriting with Cuban traditions for an exciting sound. Tickets are available here. Thursday, September 15th (5:30 – 7pm): OSU Outdoor Jazz – The Ohio Jaztet at Browning Amphitheatre. The Ohio State University Jazz Program is getting the year started with a free outdoor concert featuring its talented faculty combo. The Ohio Jaztet is comprised of Shawn “Thunder” Wallace on saxophone, flute and clarinet, Anthony Stanco on trumpet, Kevin Turner on guitar, Andy Woodson on bass, and Jim Rupp on drums. Mirror Lake should be a lovely setting for the performance, but in case of inclement weather, the rain location is the Weigel Hall Auditorium.